If you’d like help with your payroll tax, we’d be happy to give you a quote. You’ll be assigned your very own payroll tax expert and our prices start at $4 per employee per month. The withholding tax rates for 2017 reflect graduated rates from 1.4% to 8.97%. The 8.97% tax rate applies to individuals with taxable income over $500,000. The wage base increases to $33,500 for 2017. The employee withholding rate will increase to 0.765%. The maximum unemployment tax withheld from wages will be $256.27 (SUI- $175.87, SDI $80.40). The base week for 2017 will remain at $168.00. New Jersey taxpayers with a prior year tax liability of $10,000 or more are required to make tax payments by EFT. Once the taxpayer is required to make EFT deposits applying the threshold, all future payroll and business tax deposits must be made through EFT, regardless if the threshold is met each year after. Business taxpayers required to use EFT, and failing to do so, may be subject to severe penalties. Please contact us is you have any questions or need help completing a Business Enrollment Application. You may also call 1-800-555-3453 (Federal) or 609-984-9830 (New Jersey) for assistance. For further information contact us or call the State of New Jersey at 1-877-654-4737 (1-877-NJ HIRES). 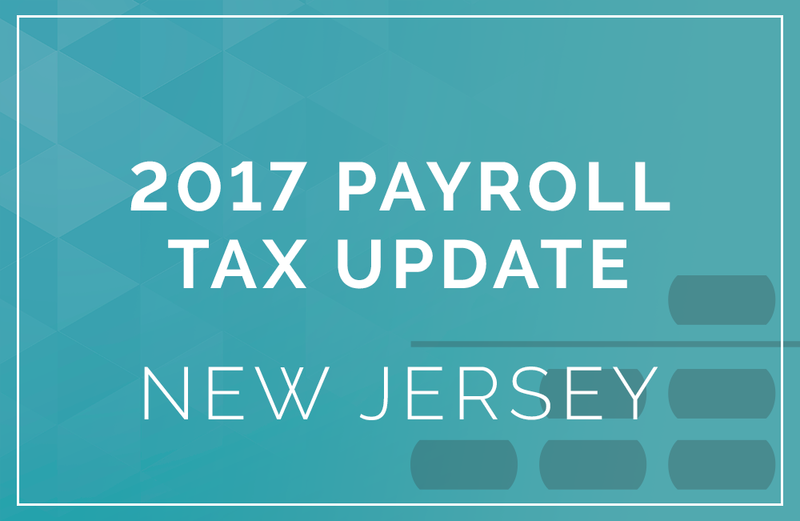 View more rates on our Federal Payroll Tax Update page.